We weren’t expecting a very tall structure, and it isn’t, but it is definitely long! A garden which was blossoming with daffodils and other spring flowers surrounds the crab. Walking toward the back of the crab, we found that the crab is hollow. I bet there's a fun echo in there! According to the sign, the crab was also seen in the movie, The Twilight Saga: Eclipse. I hadn’t seen that movie yet, so I rented it and watched the entire movie looking for the crab. I didn’t find it. I even watched parts over again, to see if I had missed it somehow. Still I couldn’t find it. So I Googled it and found out that the crab itself doesn’t actually appear in the movie. Instead, it appears on a T-shirt that Bella’s mom made into a quilt, along with many other T-shirts from trips they’d taken together. The quilt is only in a couple of scenes and I didn’t see the crab in the movie itself, but one of the special features on the DVD is a 6-part documentary about the making of the movie. Part 2 is titled Pre-Production: Setting the Stage. 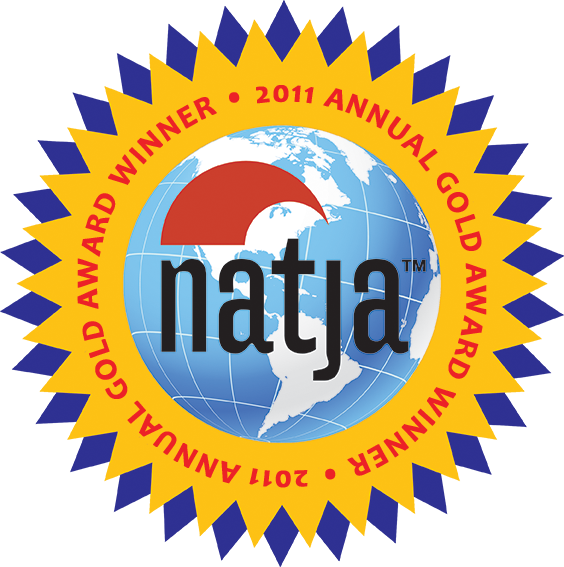 This 12-minute feature covers various topics including vampire boot camp, set construction, and the making of props, including the quilt. Quite a lot of effort (400 hours) was put into making the quilts (they made three of them) from researching T-shirt companies, to making the shirts, to aging the shirts, then finally constructing the quilt. 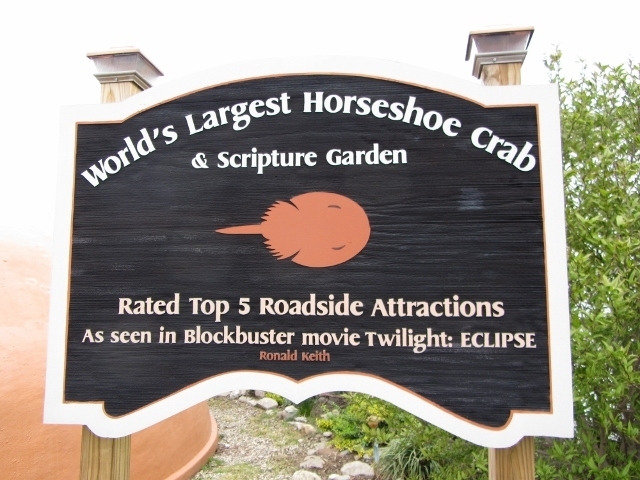 While you’re visiting the World’s Largest Horseshoe Crab, you can also view the church’s other garden, Calvary’s Hill and Garden Tomb, which has three crosses and an empty tomb. Blanchester’s other main draw is the movie theater. It is a bargain hunter’s dream with first run movies with $2 matinees. Well, I’m not sure -why- I would want to sit underneath a crab, but it’s good to know that the benches are there…just in case! I’ve got to make sure I check this one out next time I travel further south in Ohio. 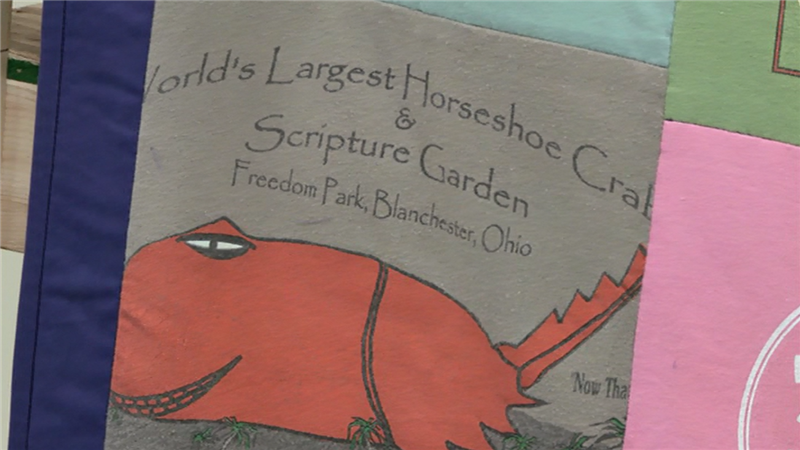 I had no idea the World’s Biggest Horseshore Crab resides in Ohio. My family is headed to Cincinnati in a few weeks so I’ll this to our stop. Are you going to the American Sign Museum? It’s re-opening in Cincy soon. That’s someplace I would love to see! The museum (http://signmuseum.org/) reopened today in its new location and will now be open five days a week (Wed-Sun) on a regular basis. It’s a dandy. 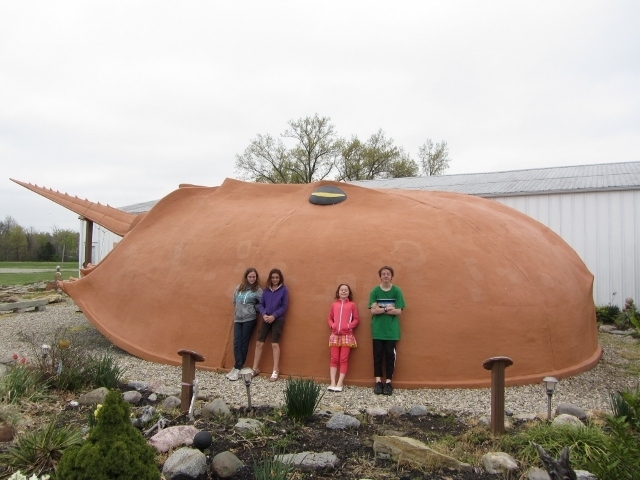 Oh my gosh, I had no idea that Ohio had a World’s Largest anything. Definitely worth a trip to check it out. Thanks for the fun idea! I definitely did not expect it to be in OH! I figured FL since we see them here all the time! Yes, learn something new everyday!! Being featured on a T-shirt in a quilt in the special features of a DVD of a movie is a new one for me. 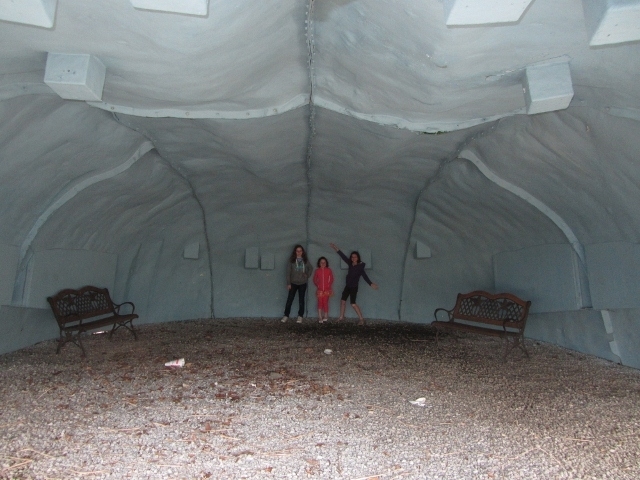 Not many roadside attractions can claim that I’d guess. Gene Sullivan’s 2008 motorcycle jump over the crab was filmed by TBN for later broadcast so there may be an official movie appearance (there are plenty of amateur YouTube videos) out there. Searching the TBN site for “crab” mostly turns up references to The Crabb Family and none of them appear to be especially large. Someone jumped over the crab on a motorcycle?!? Wow; I had no idea! Thanks for the info! Did you know that the horsehoe crab is one of the world’s oldest creatures? Not the individual crabs themselves, but today’s horseshoe crabs are direct descendants from identical creatures which inhabited the seas over 240 million years ago. Really? I didn’t know that! We went to Gatorland last week in Orlando, and learned that alligators have been around for quite some time, as well. We also saw a few of those timeless cockroaches, but we didn’t have to go to a special attraction for that!